SUJAY Montessori is a private Montessori House of Children serving children between the age group of 2 years and above.We also have the facility of "Play group" for the children aged around 2 years. SUJAY Play group was founded in 1999 and graduated slowly over a period to Montessori house of children. The children from Sujay Montessori have successfully completed the Montessori education and have joined some of the reputed schools like Delhi Public School, National Public School, Kumarans etc. We @ Sujay Montessori want learning to be great fun for the children. Children need the benefits of having individual attention, as the first formative years are very crucial.Every child has his own inner time table to indicate when he is ready to proceed to the next step of learning. 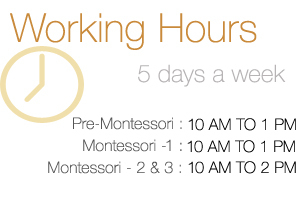 This concept is given utmost importance at Sujay Montessori while planning the work environment. This will help the child to learn at his own pace without pressure so as to enjoy and love the whole process of learning. The environment is such that the children are able to relax, settle down and "Learn by doing". In the "Montessori Method" of education, learning is imparted through scientifically designed tools introduced by the great educator and founder Dr. Maria Montessori. We follow this Montessori method of education to cater to the changes and development in the child.These scientifically designed tools are presented to the child by well-trained montessorian.The role of Montessorain is to introduce children to materials, and then remain a “silent presence” in the classroom. One distinguishing feature of the Montessori method, at the pre-school age, is that children direct their own learning, choosing among the sections of a well-structured and stocked classroom, the curriculum including Practical Life (materials that help with practical and often daily activities, which include the refinement of fine and gross motor skills), Sensorial (senses and brain), Language, Mathematics, Geography, Science, and Art.